1. These bottles kits are perfect for shampoo, conditioner, lotion, body wash, face wash, or sunblock. Being packed with a TSA approved travel toiletry bag, easy to carry without checking, no more hold ups or hassles at the airport. 2. Our 5 pack Travel Bottles Set are made of BPA free and Food safe soft silicone which can be used for lunchbox for salad dressing, ketchup/mustard etc. 3. The travel bottles use a cross-return valve, which can control the flow and prevent waste. 4.The travel bottles with three leak-proof cover and cross-return valve can ensure that no liquid flows out. 5. These best travel bottle accessories have a wide mouth and large diameter design, which make the filling more convenient. 6. The mini size is more portable to carry on. These 5 pack travel bottles can relieve your travel burden as much as possible. 7. The material-silicone is soft and comfortable,these travel bottles are also convenient for storage. Pleasw fill it up at least 3/4 of the desired liquid you want to put inside it, leaving room for air in order to avoid leaks. The travel bottles are reusable,and pollution free. Soft silicone body design allows you to squeeze out shampoo, facial cleanser or any liquid you have putted easily,more convenient to carry and more easy to use. 5 bottles ,3x 3oz + 2x 1.25oz with 1 cover bag. FOOD GRADE SILICONE, BPA FREE: These silicone travel bottles are made of FDA approved and BPA free food grade silicone, making it safe for other liquids like sauce, salad dressing or even baby food. We fully stand behind our products for their quality and longevity. EASY TO FILL/SQUEEZE: Our travel accessories bottles are easy to refill due to the large opening when unscrewing the cap and even easy to squeeze out the last bits of shampoo in order to make sure your shampoo not being wasted. 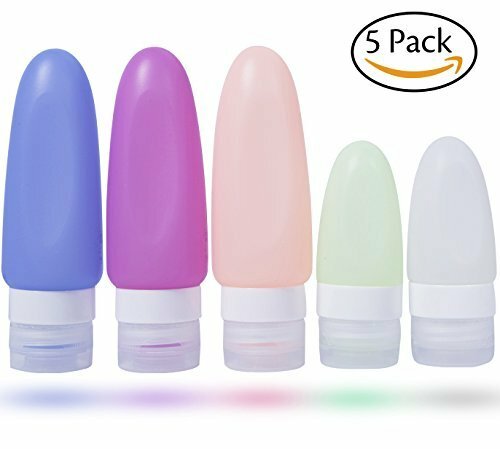 RECOGNIZABLE COLORS AND SIZES: YHmall 5 pack Travel Bottles Set (3 oz * 3 + 1.25 oz * 2) in different sizes and colors will help distinguish and sort the contents of each travel bottle easily. PORTABLE FOR TRAVEL: The travel size bottles for airplane are portable and convenient for dispensing shampoo, conditioner, body wash, lotion and more. Being packed with a refillable shampoo bottles, saving space, easy to carry, TSA airline carry-on approved. RISK FREE GUARANTEED: Your purchase is fully protected when you order today. If you are not satisfied with your travel bottles, contact us at any time, we will get you back within 24 hours try our best to make things right. If you have any questions about this product by YHMALL, contact us by completing and submitting the form below. If you are looking for a specif part number, please include it with your message.